Location: Chicago’s Logan Square area (TBD). See Angelic Organics Learning Center site for details as they become available. NEW: This year we will have access to a functioning chicken coop! Home to Roost has partnered with Dabble to offer a chicken-keeping class in Lincoln Park at Topics on Thursday, June 21, from 6-8 PM. You can sign up on the Dabble site. You say you’ve always thought about raising your own coop of chickens. But the laws concerning such things are too complicated and you don’t know where to begin, so you’ve never really given it a try. We say, bock bock. What are you … chicken? Keeping a city coop of chickens is legal in Chicago, and lots of do-it-yourselfers are already adding feathered friends to the backyard. 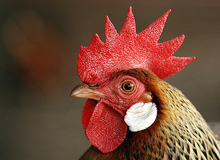 This Dabble class is designed for folks who are considering getting chickens, or who just want to know why this urban trend is growing … as well as for those who already have their own birds and who want to learn more. It’s also a good way to introduce city officials to best practices of urban chicken farming. Come learn how to raise chicks, care for adult birds, and keep your neighbors happy! Prepare to leave armed with information about raising a happy, healthy bunch of chicks and be well on your way to reaping the reward of freshly laid eggs!